The JCUSD #100 Birth to Three program earned a prestigious endorsement by Parents as Teachers National Center as a Blue Ribbon Affiliate, making it one of the top performing home visiting affiliates within the international Parents as Teachers network. The official designation was made on October 1, 2018. Being named a Blue Ribbon Affiliate affirms that JCUSD #100 Birth to Three program is a high-quality member of the home visiting field, implementing the evidence-based Parents as Teachers model with fidelity. Families in Jersey County are positively impacted by the services delivered by this program, which include home visits, group connections, child screening and connections to community resources, equipping parents with knowledge and resources to prepare their children for a stronger start in life and greater success in school. To earn Blue Ribbon Affiliate status, JCUSD #100 Birth to Three program underwent a rigorous self-study and National Center review process to confirm that they are meeting Parents as Teachers’ standards of fidelity and quality. Blue Ribbon Affiliates are exemplary programs, delivering highest quality services to children and families. Implementation with quality and fidelity is vital in home-visiting programs as it determines a program’s effectiveness in accomplishing its original goals and intended outcomes. It also verifies that a program is being implemented as designed. Parents as Teachers rigorous endorsement process demonstrates an affiliate’s accountability and credibility to the community, its funders, elected officials and the partner organizations with which they work. 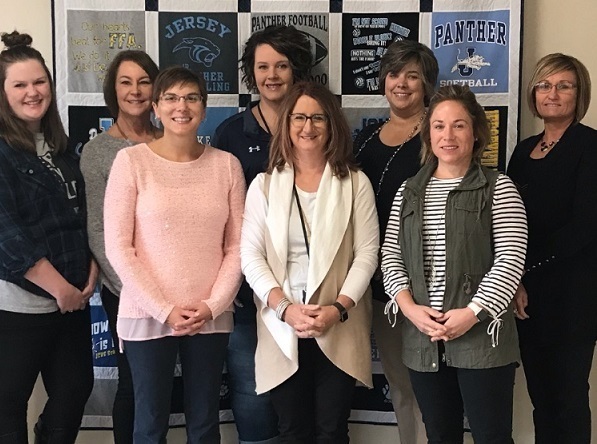 The Birth to Three program is led by Coordinator, Keri Lakin, along with Instructional Leader, Michelle Bidlack, PAT Supervisor, Michele Herkert, and Parent Educators, Tanya McGuire, Joanna Scott, Becky Robishaw, Amanda Cole, and Torrie Gilmore. Together, with many of our community supporters, we work very hard to provide families in our community the support needed to have the absolute best start when they begin school. If you have a child that is age birth to 3 or are having a child soon, please contact us to discuss the services we can provide you and your family. Please call 618-498-4322, extension 4 to make an appointment with our parent educator staff.